On average, Malaysia’s per household electricity consumption is 251 kWh per month. In terms of carbon dioxide emission, this is translated to release of 171.68 kg of CO2 per household per month. Original chart by ilsr.org. I modified it to include Malaysia in the comparison. Note that there's little need for air conditioning in Germany compared to the United States, but air conditioning only accounts for about 20% of U.S. household electricity consumption. Leaving the air-con out of the equation makes it 9,200 kWh vs. 3,100 kWh. 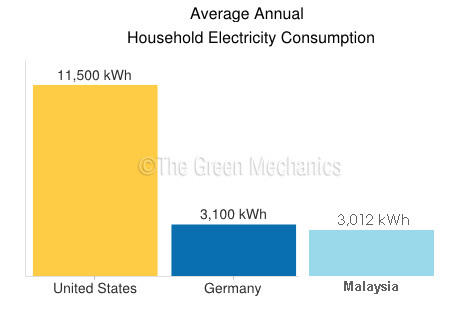 Malaysia electricity consumption is averagely 3,012 kWh per household per year or 251kWh per month. The following following SESB electricity bill shows electricity consumption for that month is 472kWh or 5664 kWh annualised. 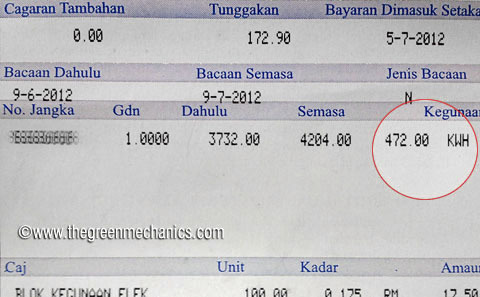 If you want to calculate how much carbon dioxide you release every month, take your monthly utility bill and look for the kWh figure as shown in the photo above. Multiply that with 0.684 and you get the amount of CO2 emission as a result of your energy consumption. In this case about 322 kg of CO2 (472kWh x 0.684) is release to the environment by this household. Every one kilowatt hour (kWh) used releases 0.684 kg of carbon dioxide (CO2) emission, the gas that contributes to the green house effect, blamed for global warming. You now know where you stand, and if everyone plays their role by taking steps to ensure that they are using the least amount of energy possible, it will make a big difference. 2) Analysis of Residential Electricity Consumption: Is Reform Needed? Figures were from study by UNITEN and also from report by The Sun Daily. Both were available online at the time of posting, I now realise that they don't keep archive of their data long enough probably due to storage capacity limitation of their data bank. You could still probably ask the them if they have these kept in their offline data centres. The URL address is there for reference, they might be able to trace. Would like to ask how to install power regulator to regulat and stabilising power within house. Need some recommendation on what brand, how many watts from house with 2 bed rooms (1 or 2 air conditioning, 1 TV, 1 freezer, 1 water dispenser (COWAY), 1 water heater(Shower) and 1 washing machine. Reason for using power regulator: The power supply from SESB That supply to my area isn't stable. Most of the time the power will be come weak up to very low incoming until all electrical devices in the house will be shutting down and will damage the electrical within the Houste that requires 24hrs operating, such as freezer, Coway water dispenser and even broke down the air conditioning compression, fan and so on. Thanks for your attention and care.